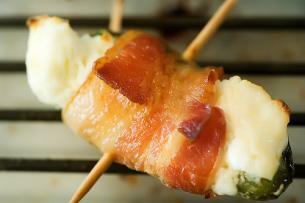 It’s a “Bacon-Wrapped Jalapeno Thingy”, courtesy of The Pioneer Woman Cooks. Who could resist this appetizer? My video on Chili Peppers and our How to: Chili Peppers will serve as a great introduction to peppers for the beginner cook. If you like a hint of “heat” in your food, experiment by adding chili peppers to everyday dishes. Chop up some chili pepper and toss it on scrambled eggs, sandwiches or burgers, stir-fries, soups or stews. Add or subtract chili depending on the level of spice that you like. Be sure to remove the stem and seeds, since that’s where a lot of the really hot heat is stored! 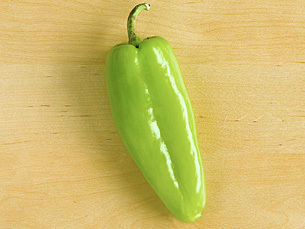 Jalapenos are one of the more recognizable peppers here in the USA, as they are very popular in Tex-Mex cooking. Recipes call for a variety of different forms of jalapenos including fresh, canned, and as a sweet hot pepper jelly. 1. Bacon-Wrapped Jalapeno Thingies (shown at the top of the post) have three great ingredients going for them: spicy peppers, cream cheese and bacon. Everyone will just love this flavor combination! 2. Jalapenos Stuffed with Sausage (shown below) pack a real kick, particularly if you use hot sausage! Using sweet sausage may be a safer bet for your next party. 3. If you find jalapeno peppers are too hot to handle, here’s a recipe that cheats, using jalapeno pepper jelly in a glaze for fish, chicken or beef. Crabby Cook modified this glaze (seen on America’s Test Kitchen) and promises that it “won’t burn your mouth up.” This recipe does include cilantro, which sort of looks like flat-leaf parsley, but for many it is an acquired taste. 4. Surprise your company with this easy treat: put an 8 ounce block of cream cheese on a serving plate. Pour a 10 ounce jar of hot pepper jelly over the cheese. Serve with your favorite crackers! 5. Ina Garten’s recipe for Jalapeno Cheddar Cornbreadtakes five minutes to mix the ingredients, which then sit at room temperature for 20 minutes before baking. For this recipe, don’t forget to pick up a box of cornmeal at the grocery store! 6. 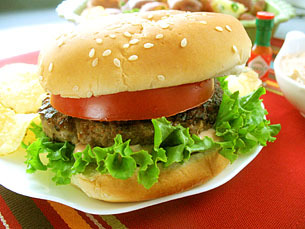 My video on Tex-Mex Cheeseburgers uses canned jalapenos in the sauce. Try this just once and it will become a family favorite in your house too! 7. Instead of using Tabasco sauce in my Tex-Mex Bean Salad recipe (shown below), try chopping up some fresh jalapenos. This recipe is great to serve on a buffet! 8. Stuffed Poblano Peppers is an easy, improvised recipe that involves five ingredients. The poblano peppers are stuffed with browned ground beef and cooked rice, mixed with ready-made enchilada sauce and canned diced tomatoes. 9. This Food & Wine recipe for Poblano and Portobello Stuffed Mushrooms is one of those “company’s coming” kind of dishes. Or it could make a classy, light vegetarian meal for you and your sweetheart. Poblanos add a lot of flavor but not too much heat! 10. Skinny Chef uses pickled cherry peppers for this great recipe: Cherry Peppers Stuffed with Mozzarella and Basil. Jen will also answer the question on whether or not Chilies Can Help to Control Your Weight! 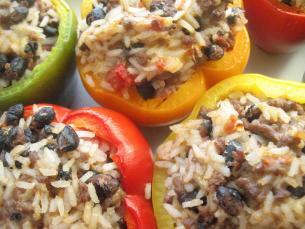 Or for no heat but lots of flavor, check out my photo-tutorial on Stuffed Peppers (shown below)! Do you have any Chili recipes?